In the autumn of 1863, the Union cause in the American Civil War was threatened with potential disaster, as one of its three principal armies had been defeated in the Battle of Chickamauga and had retreated into the defenses of Chattanooga, Tennessee. But there it was besieged by the Confederates and in danger of starvation or disastrous retreat. In the meantime, the Federals had occupied East Tennessee, but were threatened from both the north and the south. 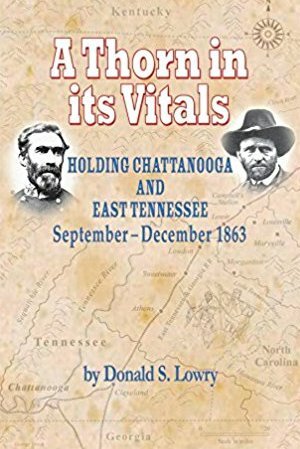 President Lincoln, however, wanted badly to hang on to both Chattanooga and East Tennessee, which he considered a deadly thorn the vitals of the Confederacy. Both the senior Union officers in the defenses and the senior Confederates in the army threatening them were at odds with themselves the Federals over the lost battle and what many of them considered an unnecessary retreat; the Confederates over lack of cooperation during the battle and the commander's timidity during the Union retreat. How the two sides worked through their difficulties including their crises in command is the subject of this book, based primarily on the writings of the participants at the time and thereafter.